Random facts about Finnish coffee culture #19: A good rule of thumb is that for every pastry, there is one portion reserved for every guest, plus perhaps couple of more so no one would have to take the embarrassing last piece. In case you'd like a second round, first make sure everyone already had one. 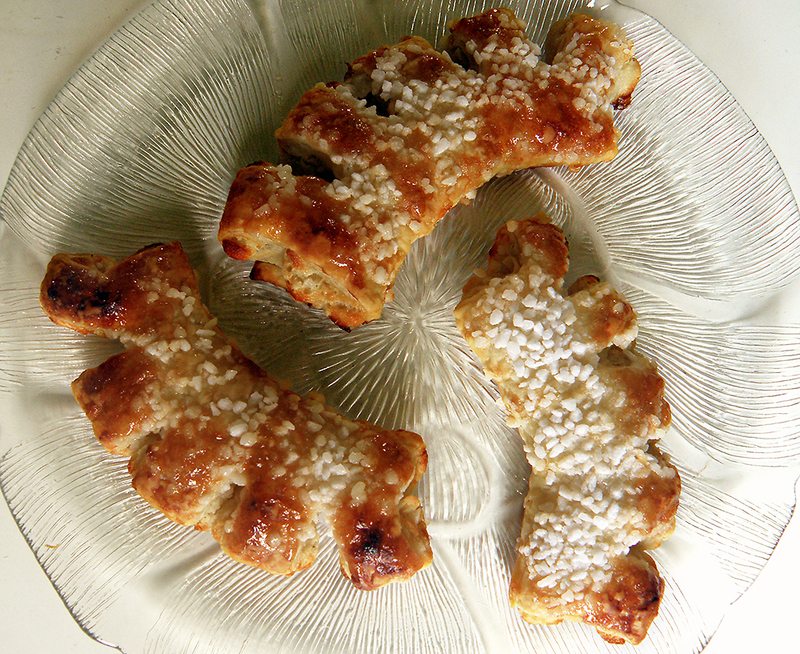 In English pastries made with the puff dough are called Danish pastries, but Finns call them Viennoise pastries. Perhaps Denmark is too near to be thought fine and above the average people. Because this form of puff pastry has become a synonym for meetings where participants wear ties and are generally either leaders of big businesses or involved in politics. Perhaps that's a bit unfair considering innocent they look! Prepare the pastry in the normal way. Roll it out into a thin layer and cut into square pieces. Thin the almond paste by mixing a dollop of water with it. Spread the paste onto each square. Then fold facing sides of the square to the middle and turn the seam down. Random facts about Finnish coffee culture #18: Today, coffee is an extremely democratic drink. There isn't much change in the drunk amounts between the poor and the rich, men and women or city and countryside. Even economic booms or depressions don't seem to affect the total amounts so much. The little autonomic island group of Åland has its own version of the Finnish oven pancake which we call pannukakku or ropsu. It's most often a dessert but has traditionally been offered even as a starter in weddings. I picked it here since I think it's a perfect snack with coffee, especially on a summer day when friends come for a visit. The coffee table doesn't even necessarily need any other pastry with this. The Åland version is made into semolina porridge, spiced with cardamom and is usually a bit thicker than normal pannukakku. You could also try rice or oat porridge instead of semolina. I used sweetened soy milk here, but if yours isn't sweet or you use oat milk instead, you can add a few spoonfuls of the white drug. Heat up the milk. Add semolina and stir until the plot thickens. Remove from heat and mix in the rest of the ingredients too. Spread on a baking sheet. Bake for half an hour in 225°C. Serve with ice cream or whipped soy cream and jam or berries. 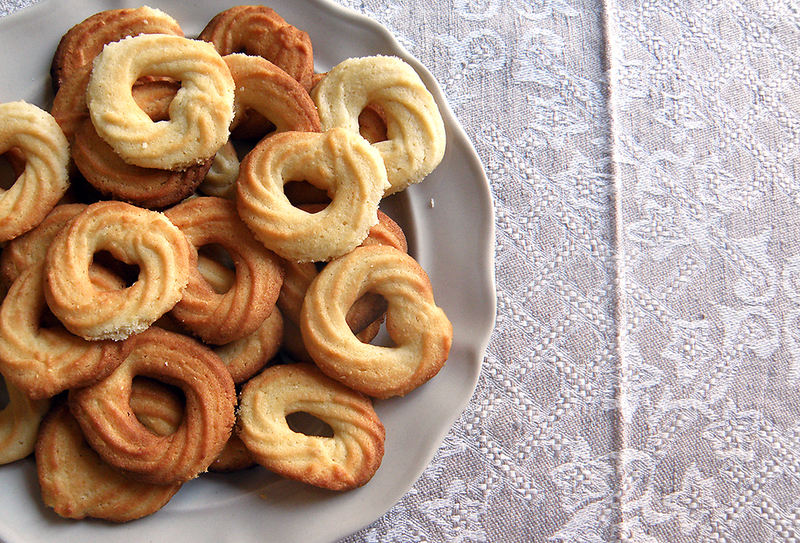 Random facts about Finnish coffee culture #17: The first and the last piece of every pastry are considered important, and no one is usually willing to take them without a direct encouragement by the hosting family. In case it's someone's birthday or name day, and there is a layer cake, the lucky boy or girl is expected to cut the cake and take the first piece before anyone else, and it would be considered extremely rude to queue-jump before him/her. 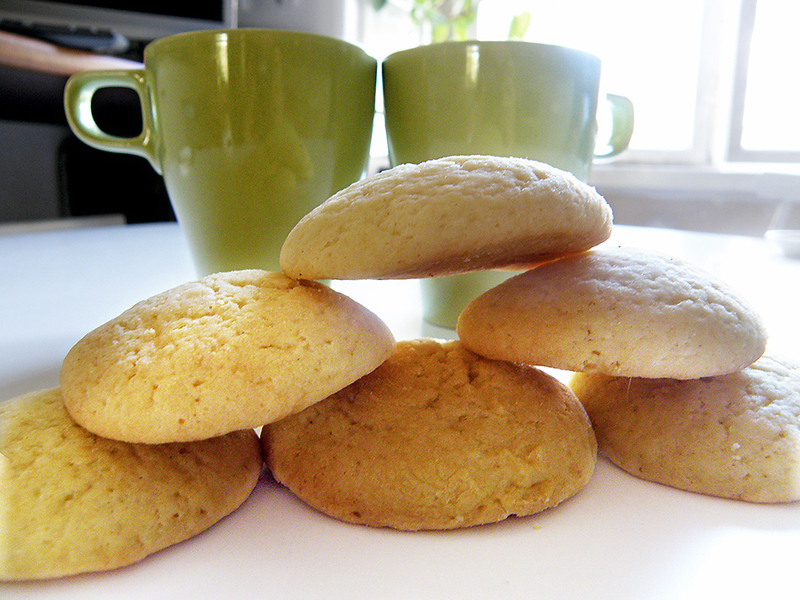 One more biscuit recipe! There are a few versions of the classic wreaths, like vanilla wreaths or lemon wreaths, and you could add pretty much any flavouring to their subtle delicacy. I bet lavender or meadowsweet would work here great. The most common one though is the almond version. What I love in them is how easily you can get something that looks like you've gone through a whole lot of trouble. Pipe the dough into wreath shape, straight onto a baking sheet. Bake 5‒7 minutes in 225°C. Watch them very, very carefully at the end of the baking. I managed to get both burned and underdone wreaths on the same batch. If you're oven bakes a little unevenly like mine does, it may even be a good idea to turn the baking sheet around at halfway. If you wish, you can decorate the wreaths with chocolate stripes after they've cooled down. Random facts about Finnish coffee culture #16: When coffee availability was limited, coffee grounds were used at least twice. Roasteries and individual makers both created their own substitutes. Grains, acorns, peas, beans, dandelion roots and chicory were all used (and haven't been touched since). Usually a good "replacer" involved a carefully pondered mix of several of these. Salt was also a common addition because it made the coffee seem stronger. Here's the first of the two. 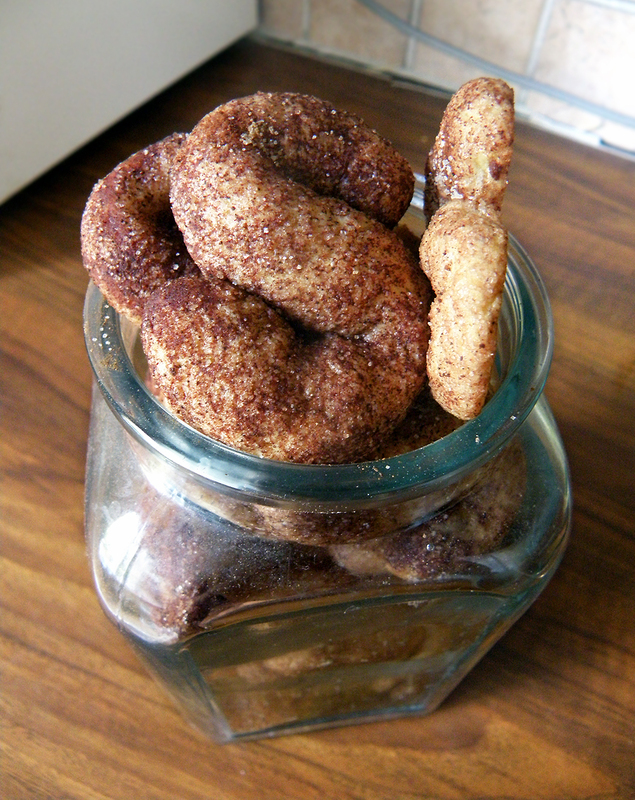 They're called cinnamon esses in Finnish, but since that sounded odd to my ear and cinnamon biscuit sounded just dull, I thought I'd call them snakes in English. After all, the S shape is quite slithering! I imagine upper class ladies had them with coffee when coffee had just arrived. They're still one of the every standing table must haves, but if you love cinnamon as much as I do, that's definitely not a bad thing. Dissolve the sugar in water. Mix the rest of the ingredients with them. Cover and refrigerate for an hour or two. Mix the dusting ingredient on a plate. Roll pieces of the dough into bars. (If necessary, use some four to help.) Roll the bars in the cinnamon and sugar dust. Arrange into S shape on a baking sheet. Bake about 14 minutes on the upper shelve of a 175°C oven. Random facts about Finnish coffee culture #15: Many Finns love to dip pulla and other pastries in the coffee. This procedure softens up biscuits, rusks and dried pullas, but it's also done with fresh pulla. Laplanders may even do this with salty snacks to soften up for example dried meat and on the other hand, to get a drop of salt in the coffee. These baking experiments tend to make my jaw drop. How can you achieve so different structures with almost identical ingredients and procedures? Aunt Hanna for example presents us this biscuit-like little cake that is soft, crumbly and airy all at the same time. This looks like an easy recipe, and in a way it is. But you can end up with aunt Hanna's biscuits if you stray too much from the instructions. Sometimes this is only evident the day after, which of course shouldn't worry you if you plan to eat them right from the oven. Traditionally this has been a way of using a cream gone sour, so you have a few options. The easiest one is to use 2 tsp baking powder instead of the soda. You could also just leave the cream on the table for a few days. I this version I have added vinegar to get the soda work. Place sparsely on a baking sheet, since they swallow a whole lot. Bake 8‒10 minutes in 200°C. Random facts about Finnish coffee culture #14: Finnish coffee is usually made with automatic drip coffee makers. 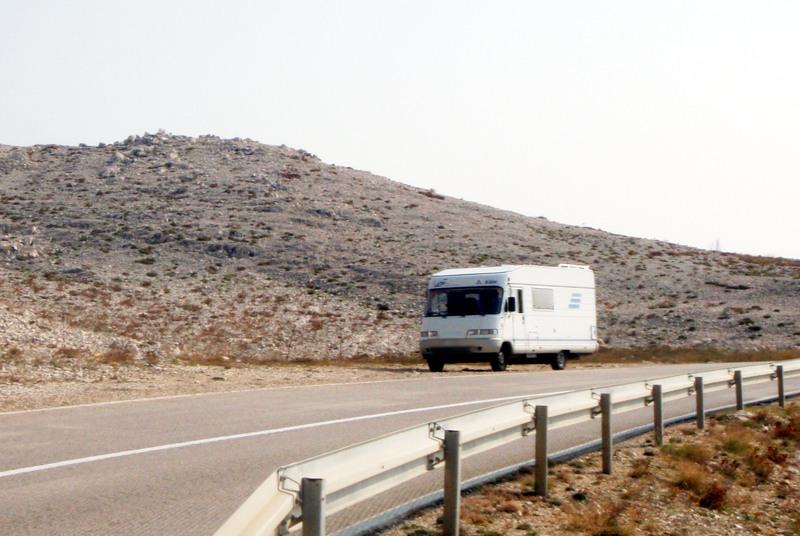 Some old people (as well as campers) still use simple boiling method. Since 1990's young people have also been interested in different "special coffees" meaning French or Italian type coffee drinks which are often flavoured, but those are still rarely brewed at home. Decaf and quick coffee on the other hand are something that are being laughed at when watching American tv-series. The pastries I've posted this MoFo haven't been especially seasonal. Considering most of my blog this feels even a bit weird. It's the peak of the harvest season with abundance of apples and mushrooms. 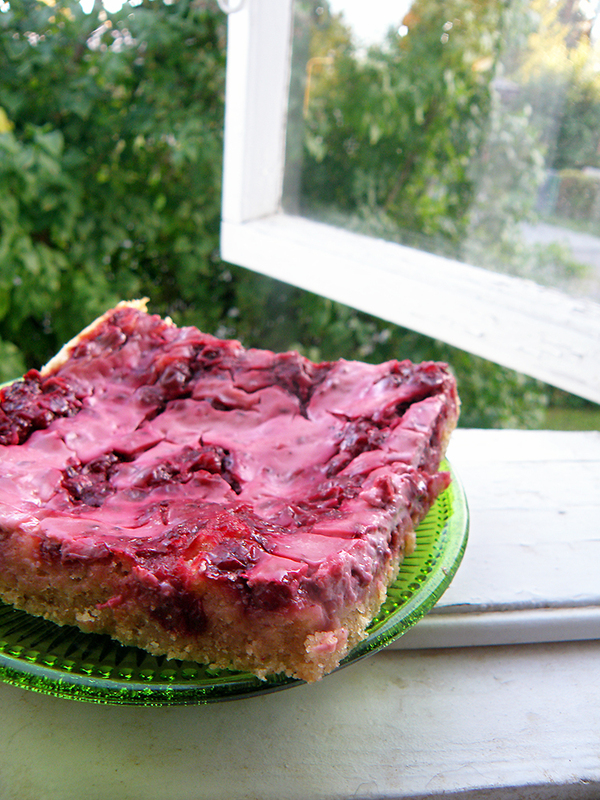 So where are all those berry recipes and open-faced pies Finnish cuisine is full of? Some of the treats I've posted already, for example a classic apple pie and bilberry kukko. But most of the classic recipes are created in the time of no freezers, and you have fresh ingredients available only for a small moment every year. This is a fun pie even in mid-winter though, because lingonberries preserve great in their own juice. Another reason is that recipes centered around berries and fruits rarely have any one proper way of making them. I've learned that it's supposed to have a crumbly crust and some cream viili to balance the sourness of the lingonberries without using so much sugar the sourness is utterly lost. 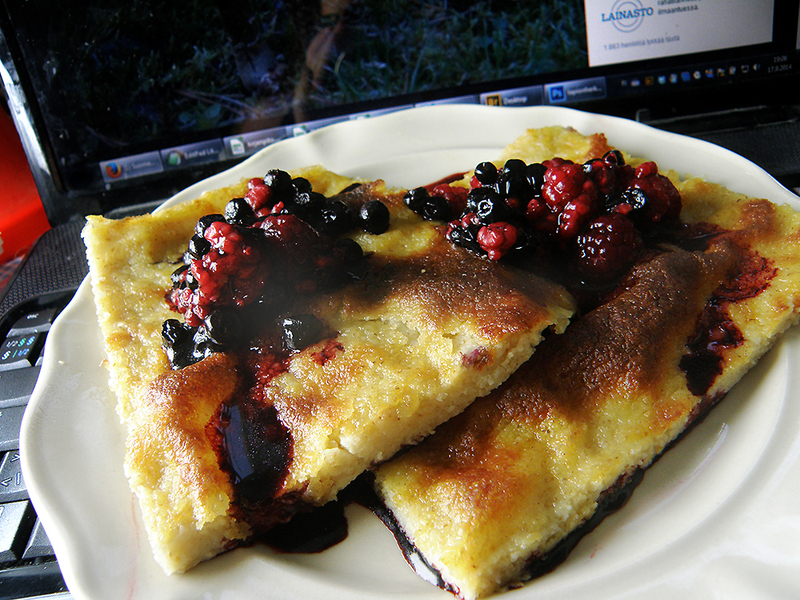 In the version you see in the photo I mixed part of the lingonberries crushed into the yogurt. More typically the colour spreads if it spreads, achieving an equally beautiful marmor of both white and pink spots. This is intended for a whole baking sheet, but in case you want a regular sized pie, half all the amounts. Bake in 200°C for 45 minutes or until the topping starts to get some colour. Random facts about Finnish coffee culture #13: Traditionally, food is respected with silence in Finland. Eating dinner with a Finnish family can still feel a bit awkward for someone coming from a culture of constant small talk. In coffee table however, the atmosphere is more carefree and this is actually a good place to catch up with the latest rumours. In modern business meetings people may even wait until they've all got coffee before starting the actual negotiation part. I've always found the name tosca weird. Does it refer to Tuscany, though I haven't found any Italian recipe resembling this and it seems more like a cousin of the French classic pie tarte tatin? Or straight to the opera Tosca and its name character Floria Tosca? The recipe could very well be from 1905, the year Tosca was first performed in Finnish National Opera. 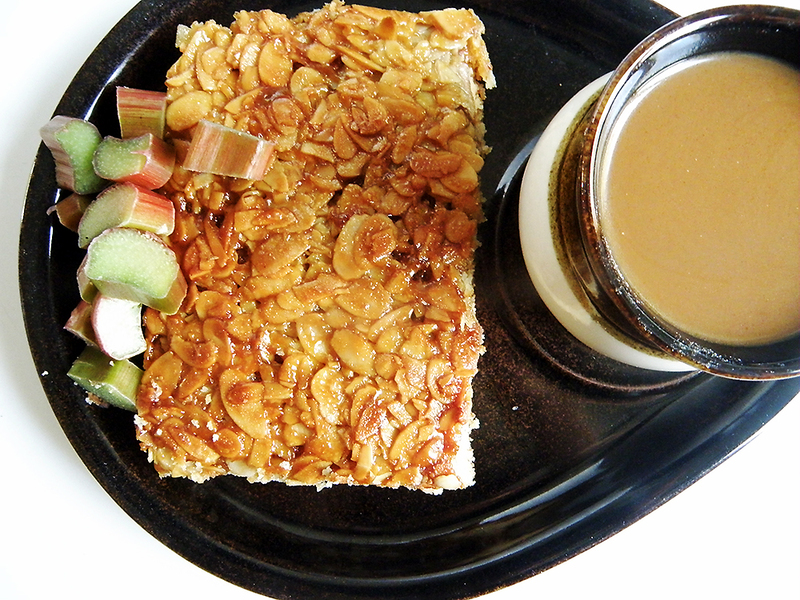 But there's more to the riddle: tosca seems to be a general name for this sort of caramel topping, and oatmeal is even a more common ingredient than almond flakes. Tosca apples for example are another classic. So the crust here seems like a mere vehicle for the opera treat. Tosca pie is often prepared with some apples or rhubarb in the crust mix. Since I'm trying to present you gouys classic versions here, I opted to enjoy rhubarb on the side. For a bit more kick though I used aromatic farin sugar in the topping instead of the regular kind. Another addition you can try is adding 2 teaspoons of cardamom to the crust part. This is another one of those whole baking sheet sized pies. If you only want a regular one, half all the ingredient amounts. Beat the crust sugar and the margarine until foamy. Add the cream and continue whipping. Combine the dry ingredients before adding to the mix too. Spread on a baking sheet. Pre-bake for 12 minutes in 200°C. While the crust is in the oven prepare the topping. Combine all ingredients in a sauce pan. Cook for about ten minutes or until the blend starts to look thick and brownish. Spread on the crust and return to oven for 10-15 more minutes. Enjoy with coffee and some sour fruits! Ostoskorin loppusummasta vähennetään viisi euroa ja toimitus tapahtuu ilman postikuluja. Tilauksen on oltava vähintään 35 eur, mistä jää maksettavaksi 30 eur.